Anyone who knew Gregg knows what an incredible talent he had for relating to people and bringing out the best in each individual. As a management psychologist, he had a deep optimism for the potential of others and worked tirelessly to spotlight and draw out skills and strengths in interpersonal connection, effective communication, problem-solving, and leadership. With his heart close to the medical field, one of the spaces in which Gregg worked hard to develop leadership was primary care. Gregg believed in Primary Care Progress’ (PCP’s) mission and, from the beginning of the organization, helped build the foundation of PCP’s successful leadership training. Now in its fourth year, PCP has continued to build on Gregg’s legacy and supports a growing network of over 42 interprofessional, student-led primary care advocacy chapters. These chapters from around the nation are harnessing these unique leadership skills and advocacy approaches to advance primary care in academic settings and beyond. The 3rd Annual Gregg Stracks Leadership Summit is a unique opportunity to showcase best practices in primary care leadership. Bringing together leaders from PCP chapters as well as a mix of other nationally renowned primary care innovators and advocates, the summit provides participants with two days of intense training and coaching in effective communication and media, team-building, change management and strategic advocacy for primary care. Few of these skills are currently taught in health professional training programs, yet they’re essential if we are serious about saving primary care. These skills were essential to Gregg, what he taught us, and the legacy he leaves. This year, PCP is proud to announce the new Gregg Stracks Award for Leadership in Primary Care. The Award will honor a member of the PCP leadership team who has shown exemplary leadership in building teams to advance primary care and who embodies the important qualities Gregg modeled. To read more about the Gregg Stracks Award for Leadership in Primary Care, click here. The ocular melanoma specific initiative that Sara and Gregg co-founded with the Melanoma Research Foundation (MRF), CURE OM (Community United for Research and Education of Ocular Melanoma), announces the 2013 ocular melanoma specific research award recipients and celebrates 2 years of accelerating research and committing services, education, and support to support to OM patients and the people who support them. To read more about the research being supported and all that has been accomplished to help the OM community, you can read the press release here. Gregg was a founding member of the national non-profit organization, Primary Care Progress (PCP). Gregg's collaborative leadership, commitment to self-improvement, and focus on teamwork, among other qualities, continue to be an integral part of the fabric of the organization. To read meaningful words about Gregg's impact written by Gregg's friend and colleague, and PCP's founder and president, Dr. Andrew Morris-Singer, please click here. PCP's 2013 Gregg Stracks Leadership Summit was a huge success and had an impact across the country. The summit honors Gregg's work and impact as a founding member of PCP. To read more about the 2013 summit you can click here. Boston's NPR blog, WBUR's CommonHealth, recently wrote an heartfelt story about Sara and Gregg and their work in the uveal melanoma community. The article also highlights, and raises awareness about, the disease itself and what research is needed to continue to move the field forward and save lives. You can read the article here. The Gregg Stracks Leadership Summit honors Gregg, who was a founding member of Primary Care Progress (PCP). Gregg's commitment to improved leadership practices and the value he placed on community building and teamwork provide the core framework for PCP's grassroots advocacy efforts. Working with both individuals and team, Gregg designed his assessments, feedback, and coaching to ensure that leaders not only gained a greater perspective on their leadership strengths and developmental areas, but also were provided with concrete ways of leading more effectively. By emphasizing the importance of self-reflection for improved leadership capacities and outcomes, the Summit proudly honors the work and memory of Dr. Gregg Stracks. Gregg and Sara were recently recognized as the first ocular melanoma Eye Cancer Heroes by Will's Eye Institute. Their personal story, as well as their work, and Gregg's legacy, in co-founding the CURE OM initiative is highlighted in the article. You can read the article here. Sara was recently interviewed for an article on Lifescript.com highlighting the Melanoma Research Foundation, CURE OM (www.cureom.org) and Gregg & Sara's journey with ocular melanoma (uveal melanoma)... you can read the article here. I hope this letter finds you doing well. I can’t believe it has been 15 months since Gregg transitioned. I miss him terribly and I know there is a void in our community and in all of our lives. Yet, Gregg continues to be present in so many ways—his legacy, in many ways, continues to live and grow. 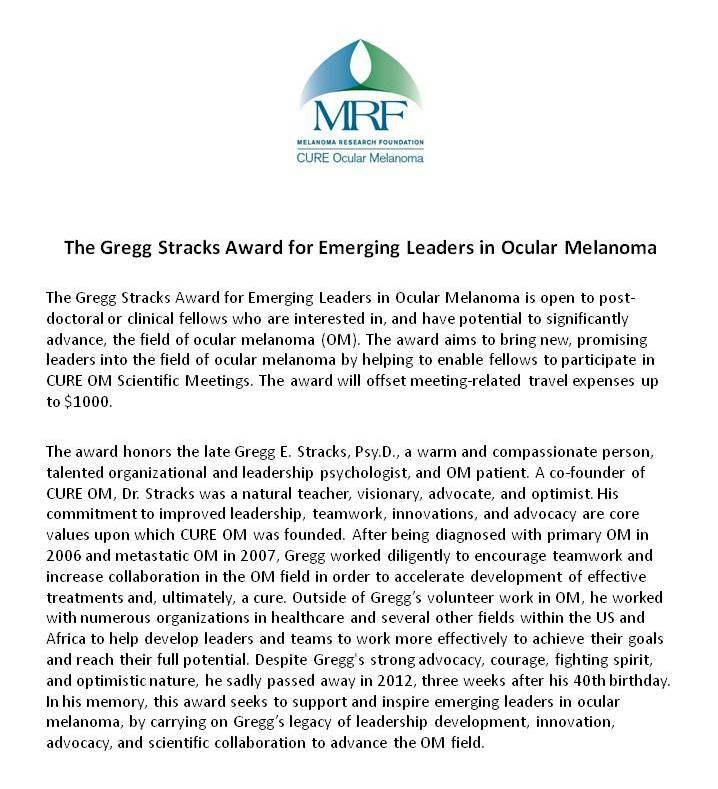 Thanks to the generosity of many of you, the Gregg Stracks Memorial Fund we established with the Melanoma Research Foundation’s CURE Ocular Melanoma (CURE OM) initiative is one area where Gregg’s legacy continues. CURE OM is the initiative Gregg and I co-founded with the Melanoma Research Foundation (MRF) in the fall of 2011 to accelerate ocular melanoma research and enhance awareness, education, and support for people affected by the disease. I’m writing with good news to tell you that through the Gregg Stracks Memorial Fund, we have recently established an award for junior investigators! You can click here to donate to the MRF's CURE OM Gregg Stracks Memorial Fund. Thank you to those who have generously donated to the Gregg Stracks Memorial Fund established at MRF/CURE OM. 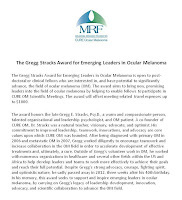 Because of your overwhelming generosity, we have been able to develop our first award program using these funds-- the Gregg Stracks Award for Emerging Leaders in Ocular Melanoma. This award is open to junior faculty who show interest, and strong potential, in the field of ocular melanoma. To see more details, please click on the image to the left. Thank you for your generosity in helping to make this award possible. We look forward to reporting additional activities that will be made possible by the Gregg Stracks Memorial Fund thanks to your support and generous contributions. To make a donation to the Gregg Stracks Memorial Fund, click here. 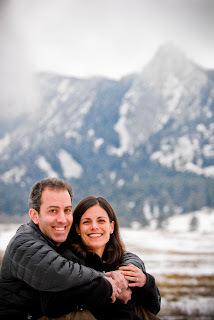 Gregg and Sara's story, and personal experience fighting ocular melanoma, is featured in a recent publication from the University of Colorado School of Medicine, entitled "Standing on Both Sides of the Examination Table." 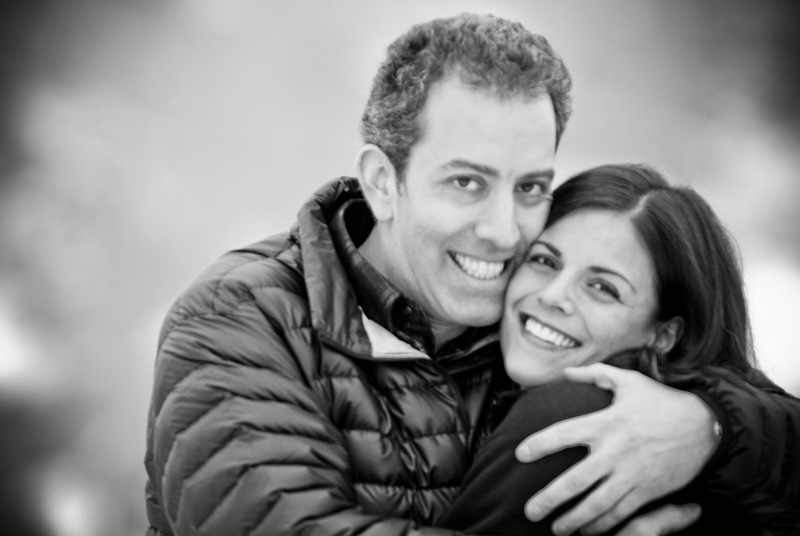 CURE OM (Community United for Research and Education of Ocular Melanoma), the initiative Gregg and Sara co-founded in the fall of 2011, celebrated its one year anniversary October 2012. In its first year of existence, CURE OM has made incredible strides in supporting ocular melanoma research and providing support to the ocular melanoma community! To read CURE OM's anniversary newsletter, click here. To date, CURE OM has raised $1 million, $800,000 for research. To read the press release announcing the $800,000 CURE OM has secured for uveal melanoma research click here. 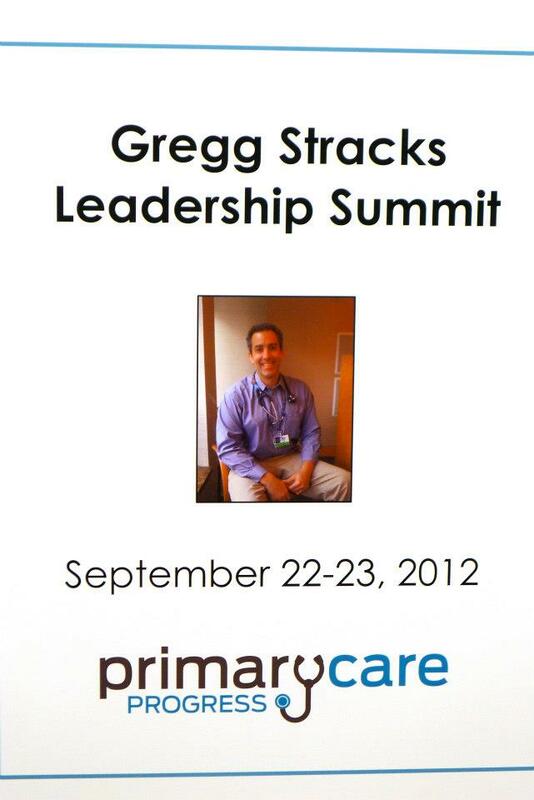 On September 22-23, 2012, Primary Care Progress (PCP) held the inaugural Gregg Stracks Leadership Summit. The leadership summit honors Gregg who was a founding member of PCP. Gregg's commitment to improved leadership practices and the value he placed on community building and teamwork provide the core framework for PCP’s grassroots advocacy efforts. Working with both individuals and teams, Gregg designed his assessments, feedback, and coaching to ensure that leaders not only gained a greater perspective on their leadership strengths and development areas, but also were provided with concrete ways of leading more effectively. Summit participants focused on strategic advocacy, team-building and interpersonal engagement--leadership skills that are critical for anyone committed to primary care clinical innovation or education reform. On the first page of the leadership summit program, PCP stated that Gregg's "commitment to learning and self-improvement remains an inspiration to colleagues, clients, and friends. By emphasizing the importance of self-reflection for improved leadership capacities and outcomes, the Summit proudly honors the work and memory of Dr. Stracks." To learn more about the Gregg Stracks Leadership Summit and Primary Care Progress, click here. Sara courageously shared her and Gregg's journey with ocular melanoma-- Living and Loving Through Ocular Melanoma-- as a guest blogger for the Stand Up To Cancer blog. Sara felt that if sharing their story can help one person in any way, and can help others feel less isolated in this often scary, overwhelming, and isolating journey, that Gregg would want her to do so. Gregg received a Patient Courage Award for his courageous fight against ocular melanoma at the CURE Ocular Melanoma (CURE OM) / Melanoma Research Foundation Gala on Tuesday, May 22 at the Cable Center in Denver. Click here for information about the gala. Click here to read the article written about Gregg by the University of Denver. Slideshow can also be viewed here. Gregg Stracks, of Boston, MA, loved life and lived each day to the fullest until his untimely death on January 10, 2012, at the age of 40, after an extraordinarily courageous battle against ocular melanoma. He died peacefully at home surrounded by his loving family. Above all, Gregg cherished time with his family and friends. He and his beloved wife, Sara, fit a lifetime of love into their 8 years together. In partnership with Sara, Gregg fought against difficult odds to live life as fully as possible and not let illness define him. To know Gregg was to love him. He had an extraordinary gift of connecting with people. He brought people together, created community, and always cared for others before himself. He made everyone feel loved and special. His generosity was unmatched. Gregg loved adventure and travel, always making new friends along the way. He loved nature and found refuge in the mountains and at the beach. He had a love of art and a gift for identifying talented artists worldwide. Gregg saw possibility in the impossible and pushed through challenges to accomplish his goals and vision. Gregg grew up in Roxbury, CT, and graduated from Shepaug Valley High School in 1989. He majored in psychology at Dickinson College, earned a master’s in clinical psychology from the University of Hartford, and was awarded a doctorate from the University of Denver. Gregg, a natural and gifted psychologist, was a born teacher and visionary. Professionally, Gregg built on his personal values, focusing on caring for others and supporting community and teamwork. He worked for the Clinton Foundation and Elizabeth Glaser Pediatric AIDS Foundation in Kenya and Mozambique to help address psychosocial needs of families dealing with HIV. In Boston, Gregg co-founded OPUS Leadership Group where he helped leaders and teams be most effective in their work. Gregg will be forever missed, and his legacy and spirit will always remain with those who knew and loved him. Gregg is survived by wife Sara Selig, parents Joan and Richard Stracks, brothers Mark and David Stracks, niece and nephew Rosulian and Richard Stracks, parents-in-law Ellen and Andy Selig, and sister-in-law Becky Selig, in addition to extended family and many cherished friends and colleagues. Sara will be sitting shiva at their home in Jamaica Plain, MA, Monday through Saturday (Jan. 16-21, 2012), 7:30pm-8:30pm. A celebration of Gregg's life will be held Sunday, January 22, 2012 at 3pm at the Veronique, 20 Chapel St., Brookline, MA. In lieu of flowers, donations may be made to the Melanoma Research Foundation, 1411 K St. NW, Ste. 500, Wash. DC 2005, to support The Gregg Stracks Memorial Fund for ocular melanoma research; or Brigham and Women’s Hospital, Development Office, 116 Huntington Ave, Boston, MA 02116 to establish The Gregg Stracks Program for Leadership and Teamwork in Medicine. In either case, please specify Gregg Stracks in memo line of check. Gregg has touched us all in so many ways and his absence will be felt forever. Please feel free to share your condolences and memories of him by clicking here and scrolling to the bottom of the page. Please make checks out to "CURE OM" and write "In Memory of Gregg Stracks" in the memo line. Please make checks out to "Brigham and Women's Hospital" and write Gregg Stracks in the memo line.